• Microwave, oven, freezer and dishwasher safe. • Stoneware must be room temperature prior to use in a microwave or hot oven. • Do not put close to the heat source such as the broiler or bottom of the oven. A national treasure, Boleslawiec ceramics have been manufactured for centuries. Developed from natural ceramic clay that can be found near Boleslawiec at the Bobr and Kwisa rivers. According to historical sources, the first stoneware was made in medieval times and in the early 16th century, local potters formed guilds to ensure perfection. Zaklady Ceramiczne "BOLESLAWIEC" was founded by one of the original men with the first pattern dating back to 1759. “10" LOVE BLOSSOMS 2 CUP BOWL“ is a EX UNIKAT pattern based of the 300 year old pattern "EYE OF THE PEACOCK". 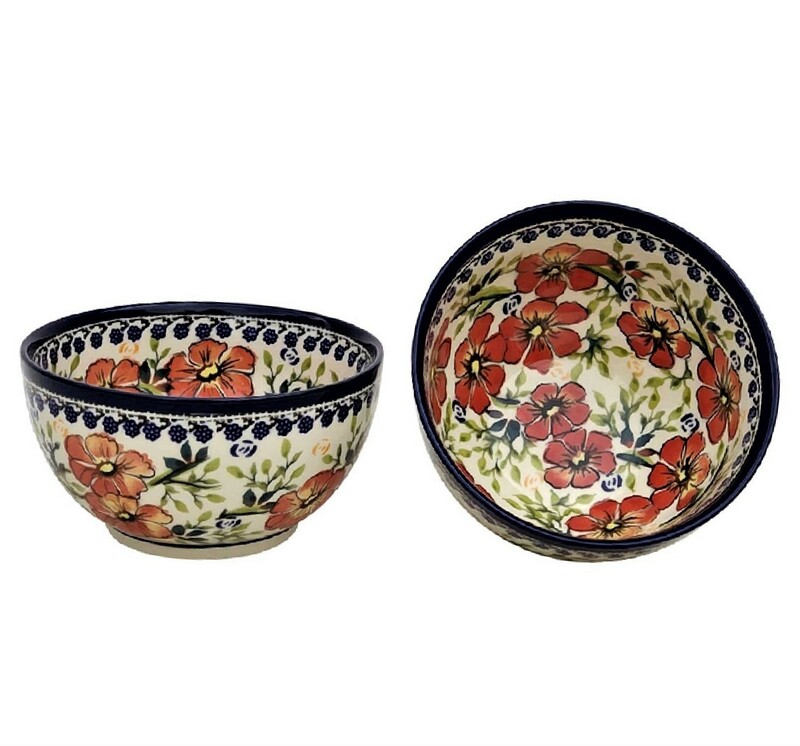 Designed by top designer and imported by Pottery Avenue, the premier importer of Polish Pottery & Polish Stoneware.The elite Master Artisans of Boleslawiec employ brushes to paint the design with expert skill and finish with minimal hand stamp work. The design was created to allow the soft, creamy white color of the famous white firing clay to be the backdrop to contrast with the vibrant poppies painted in hues of red and blooms creating an impressive EX UNIKAT red poppies pattern from Zaklady Ceramiczne BOLESLAWIEC.